I'm starting to get excited. I'm almost fifty-one and have never gone camping but in just under two weeks that will change. I'm going on my first overnight camping experience. I'm calling it an 'experience' instead of a 'trip' since I'll be camping only forty minutes from my house. Forty minutes doesn't sound big enough to be labeled a trip. If everything works out I will be camping at one of Hitchcock Nature Center's back country campsites located on Westridge Trail. By everything I mean availability and weather. The back country campsites are first come first serve and can only be reserved same day. If there is rain in the forecast I may postpone - not sure I want my first camping experience to be in rain. It's going to be a fairly bare bones camping experience. I have a one man tent (the Tarptent Notch), a sleeping pad (the Therm-A-Rest Neoair XLite), and a sleeping bag (the Eureka Hoback). This sleeping bag is not that warm - only rated for 60°F (15.6°C). I bought it originally for the Camino where cold temperatures are not an issue in albergues. I think the bag, combined with the sleeping bag liner I used on the Caminos and some warm long underwear, will be good enough for early May camping. I think I'm almost ready. I've sealed the seams for my tent so I'm ready for rain if there is any. I still need to treat my sleeping bag and bag liner with insect repellent. I went up to Hitchcock this weekend and people were picking ticks off their dog. I don't want to pick ticks. I won't have a stove. I have one on order but it won't arrive in time ... a victim of my procrastination. I'll be having a cold evening meal instead. A hot camping meal will have to wait for my second camping trip later this summer. The campsites on Westridge Trail have nice fire rings so I may bring in some wood to make a nice fire. My excitement is building. The campsites have great views to the west towards the sunset and the Missouri River valley. I'm hoping for a clear night with lots of stars. I'm packing in my camera and tripod to see if I can get some nice nighttime pictures. I can't wait to do this. We'll see if I'm as excited after a cold night out in the 'wild'. 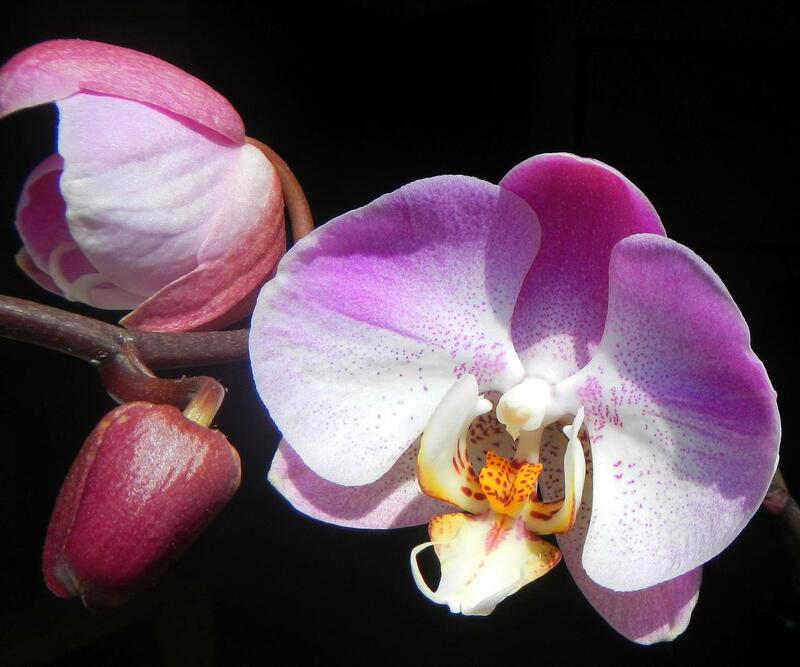 "First Of The Orchid Blooms"
The Wife says I have a green thumb. 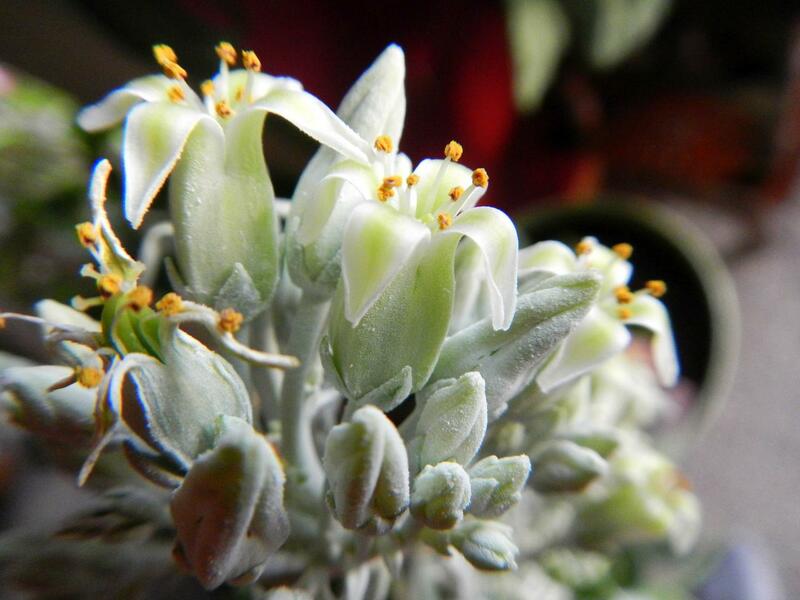 She picked up an orchid that had been tossed to the curb. I took care of it. I can't say 'with skill' since I really didn't know how to properly care for an orchid. I guess I did something right since it's seems very happy now and is in full bloom. When it came to weather, my two Caminos were quite different. The first was sunny, sometimes hot, with only a couple days of significant rain. My second Camino had less sun, more chilly overcast, and many more days of significant rain. While I was hiking through pouring rain my thought sometimes went to the subject of Rain Gear. There are basically two types of rain gear for hikers carrying backpacks: a combination of rain jacket, rain pants, and backpack cover or a backpacker's poncho. A combination of rain jacket, rain pants, and backpack rain cover. This was basically what I used on both of my Caminos except I did not carry rain pants. The Northface convertible pants I wore dried exceptionally fast when worn and walking with wet legs really didn't bother me much. I chose this option for its versatility. The jacket could be worn to keep dry from the rain both while hiking and in the towns during the evening. The jacket could also be used to keep warm. I wore a Marmot Precip . It is relatively light, full featured, and good at keeping you dry. Like most rain jackets it is not as breathable as I would desire. The trade off is usually breathable but not dry or dry and not breathable. I found that I often overheated with the jacket on - even with the pit vents zipped open. This meant that I was sometimes more wet from sweat than rain. One thing I did discover is if I pushed my sleeves up to my elbows I didn't overheat as much. Exposing my forearms was enough to keep me relatively cool and comfortable. It also resulted in wet forearms which was not an issue. My backpack was protected by my pack cover ... or at least it was supposed to be. The pack cover is a waterproof elastisized bag that covers the pack like a raincoat to keep the rain off the bag. They are not perfect since water can run between the pack and the hikers back where the cover does not cover. On my first Camino my pack cover worked well. On my second, the same pack cover provided only minimal protection. I'm not sure if pack covers can wear out and lose their waterproof-ness. Jackets can so I'd imagine the same could happen to pack covers. My pack cover went into the trash when I got home. Backpacker's Ponchos. There are a couple types of ponchos. The first is what most people think of when you hear poncho. The standard backpacker's poncho pulls on over your head. you arms poke out of sleeves. Gv used this type of poncho on her Caminos. The backpacker's poncho is different from your everyday poncho in that they have an extra hump of fabric on the back so it will go over the backpack. The poncho keeps the upper torso and backpack dry. Water will not run down between the pack and back like it will with a jacket/pack cover combination. The legs can also be kept dry depending on the length of the poncho. Usually the calves are exposed below the bottom of the poncho. Ponchos have hoods to keep the hiker's head dry. The only issue with ponchos is that it can take two people to get it on as the poncho inevitably hangs up on the backpack when you try to pull it on over your head. My job this last Camino was to pull down the back of Gv's poncho. The second type of backpacker's poncho is what I call a backpacker's raincoat. It is essentially a poncho with a zipper down the front. The backpacker's raincoat provides the same rain protection as the regular backpacker's poncho but the zipper makes it easier to get in and out of. Examples of this type of poncho is the Ferrino Trekker and the Altus (A European brand popular with Camino pilgrims). I considered getting a poncho for my second Camino but one thing stopped me - the lack of versatility. If it's raining in the evening and you want to go to a restaurant, a rain jacket is more comfortable... not to mention fashionable ... to wear. I would never consider wearing a poncho, either type, to a restaurant. The Camino, though, is different than the Appalachian Trail. On a wilderness trail a backpacker's raincoat might me a better choice for staying dry in the rain. There are a few other accessories that can be useful for keeping dry. Gaiters can help keep rain out of your shoes (I mentioned them a couple posts ago). I wore my Tilley hat to keep my head dry (and the sun off when there was sun). I found when it was really rainy and windy (like this day I will never forget) that I could pull my jacket hood up over my hat for extra protection. An umbrella is useful in the towns but I'm not sure how convenient they are while hiking. It's hard to hold an umbrella while walking with trekking poles. I have heard, though, of people attaching the umbrella handles to their backpack shoulder strap thus making it a hands free umbrella. This may work for gentle showers but I would imagine any significant wind would render the umbrella ineffective. One last thing. I've mentioned them before but I want to reiterate the necessity of using dry sacks in your backpack as an added layer of rain protection. My dry sack, when I used it properly, never failed me and saved me some grief. (Putting wet things in my dry sack was not a smart thing and I take responsibility for making that mistake.) After a long day of walking in the rain a dry sack will ensure you have dry clothes to put on at the end of the day and that ... that ... is a wonderful feeling. I was perusing a blog written by a hiker currently walking the Appalachian Trail (AT). In one of his recent pictures there was an AT symbol painted on a rock. The AT symbol is an overlapped 'A' and 'T'. 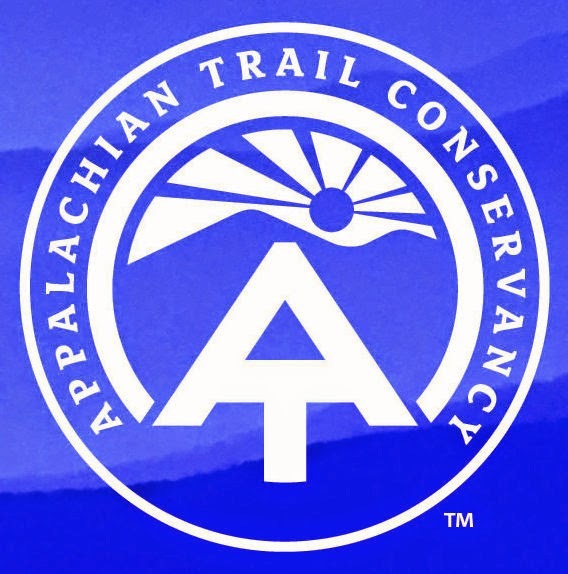 Here is the AT symbol as part of the Appalachian Trail Conservancy logo. Appalachian Trail Conservancy Logo with AT symbol. When I saw it it took me back ... way back to a time when I'd never even heard of the Appalachian trail. This symbol is a symbol from my past. My brother used to play with G.I.Joes. When he had them they were the 12" tall military figures. I inherited them from him when he moved on to Hot Wheels. By the time I started adding to the collection, G.I.Joe had changed a bit. The early 70s were a time of the Vietnam war and anti-war protests. To boost the flagging G.I.Joe sales the figures were changed from the clean cut military soldier to the bearded member of the Adventure Team. The AT symbol was the logo of the Adventure Team, a group of men (it was the 70s ...) who traveled the world exploring ruins, capturing wild animals, and performing search and rescues. The G.I.Joe Adventure Team Dog Tag. I guess the idea of the AT and adventure have been inextricably linked subconsciously most of my life. Maybe this subconscious symbolism explains why the Appalachian Trail has captured my interest so strongly. My adult mind isn't sure but my eight year old inner child says "Most Definitely!" Every year since I don't know when I have used TurboTax to do my taxes. I never had any problem until this year. I bought it on Amazon.com (downloaded it) and proceeded to install it in early February which is fairly late for me. I usually jump at doing my taxes in early January. There were no errors during the install but when I fired it up and tried to start a new return - ERROR #19649282137. It would not load. I went to the Intuit site (Intuit makes TurboTax) and went to their forums and looked for my error. I was not the only one having the problem. I put myself on a list stating I was experiencing the error and waited. A few days later, still early February, someone posted a potential solution on the forum. It suggested that a specific Windows update be uninstalled. I tried it and it fixed the problem. Actually, it fixed several problems and annoyances I'd been having with Windows and Quicken (another Intuit product). Over the next few weeks I received emails from TurboTax saying they still didn't have a fix and gave me a coupon code to use TurboTax online for free (I actually received three codes - I guess I must of signed up for the problem status updates three times). This was nice of them but, since I'd already gotten it to work, I ignored the coupons and filed my taxes sometime in mid March without anymore problems. Well, today I received another email from TurboTax. The email is dated today, April 14, 12:44 PM. This is the day before taxes are due. The email listed a solution to the Error #19649282137. You just had to uninstall a specific Windows update. Makes you wonder. I consider myself to be a bit more tech savvy than most. I knew where to look for potential solutions and I knew how to implement the solution. It was relatively easy to do. What about all those users out there who aren't tech savvy? Did they wait two months for a solution? Did they wait for a solution they could have had two months earlier? It's not their fault for being tech naive. It's TurboTax's fault for not getting this solution out at least a month earlier than it did. I still like TurboTax. I will very likely continue to use it, but their tech support ... it leaves something to be desired. Possibly the most important part of your gear when you are hiking long distances is your footwear. When I say footwear I include both shoes/boots and socks. They all combine to become a footwear system that will make or break your enjoyment on long treks. The problem is, if you ask ten people for their opinion about footwear, you will receive twenty different opinions. Here's my experience and opinion. The New Balance 978s ... similar to the 956s ... They all look the same under Camino dust. Shoes and socks. My first Camino I suffered from tendinitis in the front of my ankle. I blame the high top shoe/boot I wore. This Camino I switched from the high top New Balance 978 (high top being essentially a low boot) to the low top New Balance 956 in an attempt to reduce the chances of tendinitis. I did not have tendinitis issues this time so it appears to have been a success ... but ... I had heel blister issues. By loosening the shoe around my ankle I prevented irritation of the tendon but, I also allowed the heel to move up and down more, causing the blister problems. I also had issues with the toe box being too narrow. Both the 978 and 956 shoes are leather shoes. This makes them very rugged but it also reduces the amount of give when your feet expand and, on long hikes, your feet will expand. Along with the blister and toe box issues I also discovered the downside of gore-tex. Gore-tex, in most conditions, will keep your feet dry but I discovered in heavy rain the gore-tex liner will eventually fill up with water. I suspect my socks acted like wicks sucking water from my wet pants down into my shoes. Being water tight, once the water is in the shoe is doesn't get out quickly. Here a high top shoe might have the advantage of keeping the socks away from the wet pants thus reducing the chance of water wicking into the shoe. A pair of gaiters might have also prevented this problem. One lesson I learned was the importance of liner socks. After Astorga I started wearing a pair of tight fitting polyester blend liner socks inside of my merino wool socks. This is one of the configurations that is said to reduce blister formation. Blisters are caused by friction on the skin. The idea behind wearing two pairs of socks is to shift the friction from the skin to between the two pairs of socks. I was a bit of a skeptic since I wore only one pair of thick merino wool socks on my last Camino with little blister issues. When I switched to two pairs on this Camino my mind was changed. My feet started getting better right away and my blisters started healing. I don't think I would walk long distances without two pairs on anymore. So the one definite lesson here is wear liner socks under your merino wool socks. As for what shoes you should wear ... I'm still up in the air. This past week I replaced my 956s, which had over 700 miles on them now (and no rubber on the heals), with a pair of Solomon Eskape Aero hiking shoes. I've heard good things about the Solomon brand and I've read several recommendations for Solomons on an Appalachian Trail forum I read. This particular model are non-gore-tex with mesh uppers. The mesh uppers make the shoe lighter than my old leather shoes and are cooler (as in temperature, not in hipness). Water will go right through them but I expect they will dry quicker as well. Make sure you buy the right size. You want a properly fitting shoe. 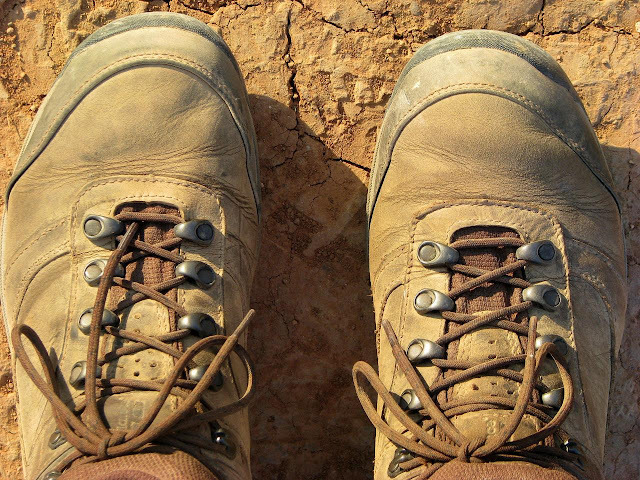 Buying a half size larger to accommodate foot expansion is often recommended for long treks. If you do this make sure your socks are thick enough to keep your feet snug in the shoe. The Solomons feel pretty good so far. I wore them on a 12.09 mile (19.45 km) walk last week and had no hot spots. This was a bit risky since you should break in new shoes before going long distances. I didn't and either I was lucky or the shoes are that good. The only bad thing I've heard about Solomons is their lack of grip on wet surfaces. I will have to watch this. One last thing about shoes. Insoles are important. I tend to overpronate. I wear custom insoles that help correct my pronation. My insoles are rather thick compared to the stock insoles that came in my Solomons. The stock insoles are, frankly, laughably thin. I was worried that my custom insoles would make my heal ride too high in the shoe but so far it seems to be fine. If you have foot issues or need extra arch support, the right insoles are important. It would never hurt to visit a podiatrist prior to a long hike for recommendations for the right insoles for your feet. Shower and post-walking footwear. After a long day of walking, your feet will expand. You will want to remove your shoes to let your feet breath a bit. You also should wear something while in the shower for hygienic reasons. My first Camino I took a pair of flip-flops. On this Camino I went for a beach/pool sandal instead (Teva Barracudas). I really liked the stability of the sandal though a little more arch support would have been welcome. The beach/pool aspect of the sandal I wore made it an ideal shower shoe as it would dry quickly. Sandals also allow you to wear socks if it is cold out (you're hiking ... not making a fashion statement) but I didn't take advantage of this on this Camino. I would have liked to take advantage of this my first Camino - wearing socks with flip-flops is uncomfortable and not very practical ... and my feet were cold at times. One last thing about feet. This isn't exactly about footwear but it is about feet which you could say are part of your footwear system. There is one more trick I used to attack my blister problem. That is lubrication. Some people swear by Vaseline - smearing it on their feet and between their toes before putting on their socks. Others use Body Glide, an anti-chafing stick that looks like an antiperspirant stick. In Spain I used Pedi-Relax, a cream that served the same purpose. Whatever you use, combining lubrication with a two sock system and well fitting shoes can go a long way towards a blister free, and more pleasurable, hike. Book: Ted Conover's "The Routes Of Man"
After an unsatisfying read I decided to move to something a bit lighter so I picked up a Travelogue. Ted Conover's "The Routes of Man: Travels in the Paved World " is a collection of six travel stories that are loosely connected by roads. The cover implies a more road-centric book but it is in fact more of a travelogue of the author's adventures. The author's adventures take place in Peru, India (the Himalayas), Kenya, the West Bank, China, and Nigeria. Each story is an interesting look at each country from ground level. Two (Peru and Kenya) are from the seat of a commercial truck that the author hitches a ride on. India is a seasonal road that forms as a river freezes over. The West Bank looks at travel in a occupation. China follows a ride with a driving club and how China is still a "wild west" when it comes to traffic law enforcement. Lagos, Nigeria, shows the state of transportation in a metropolis growing out of control. I liked Conover's writing. It sounded like your typical Joe. I'm not sure I agree with some of his opinions but those opinions are few and are only minor distractions. Some travel writers sound like they are floating above the scenery looking down on what they see. Conover feels like he's in the mix with the people he meets. There is no condescension and little sense of superiority I have felt in some writers accounts of travel. It's a light read. More detail would have been welcome but, being an anthology means each story is often short. So, if you are looking for some light travelogue reading, I would Recommend it. 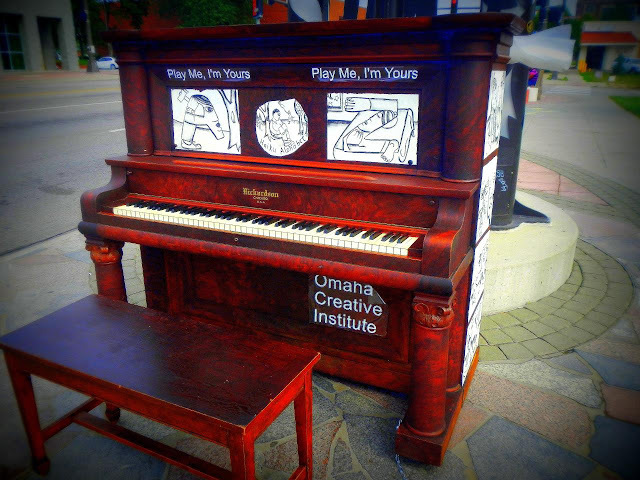 Public Piano Art in South Omaha. I thought it might be a local art project. It was an interesting idea. There wasn't anyone playing it at the time and I didn't know how to play so I just took a picture. I wish I'd seen someone playing it. It turns out it is not just a local project. Last week I came across an article talking about the pianos. They've been put on streets in over forty-three cities in several countries. The article was written by someone I met on my first Camino (Niamh). You can read her article, "Play Me, I'm Yours — Street Pianos Pull People Together" on www.OZY.com. "I Need More Of These"